Now, I didn’t expect the Angels to sweep the Rangers by any means. 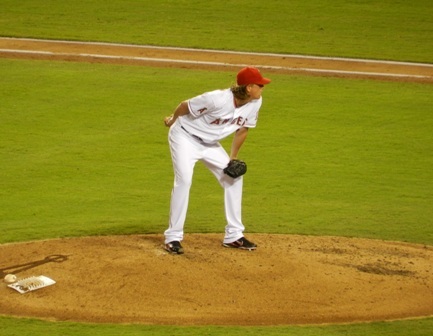 I was fairly certain they‘d win the first game with Jered Weaver on the mound. 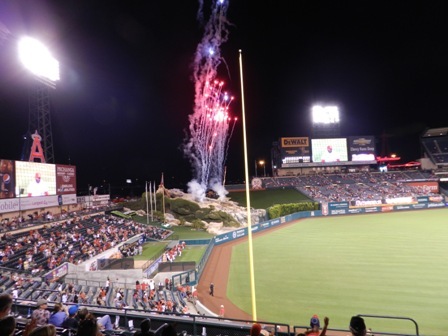 But, to be honest, I rather expected the Angels would lose Wednesday night’s game. Of course all of my jokes about CJ Wilson being the Arlinington Candidate are just that, but the facts of the matter are he’s rarely been good for much of the second half and he hasn’t been good against the Rangers this season. I did, however, think the Angels had a real chance to take the series on Thursday and, as it turns out, they did have chance. They just didn’t seize that chance, as attested to even more strongly by the long line of 0’s peppered with a few 1s and one 2 in the hit column than Ernesto Frieri’s errant pitch turned nifty souvenir for some “lucky” fan in fair territory in the 9th. 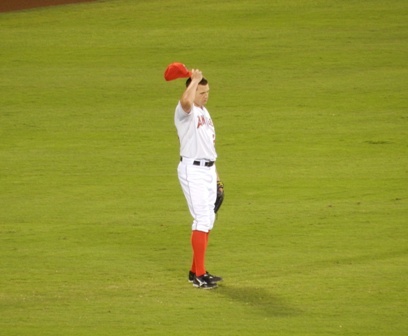 Like I said, deflating…until the White Sox series!! …But one solid Angels victory against the White Sox (with way more than the mere requisite pieces of flair in my estimation!) and I start thinking dreamy eyed Angels happy thoughts again. You know, all the Angels have to do is sweep the White Sox and then it would just like winning both the Sox and Rangers series, right? I mean, the White Sox are only in first place in their division with a few players having career years. Pshaw, how hard could that be? Then Baltimore won today and I started hearing those scales again only to have hope return when the A’s lost. 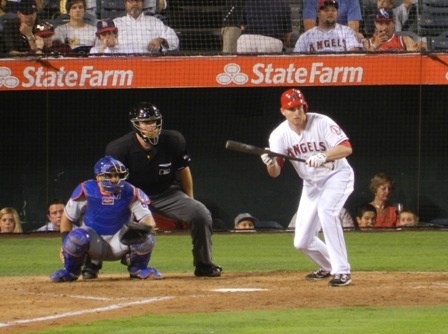 Now with a second Angels victory, I’m back to dreamy thoughts of a sweep…hey it could happen. 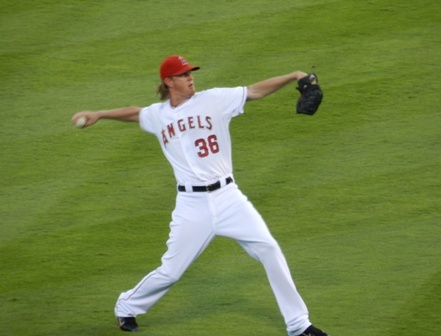 Jered Weaver is on the mound tomorrow. And then? Okay, now I will be rational. The Angels really can’t afford to lose more than one or two more games before the end of the season and the A’s have to lose a lot more than that. 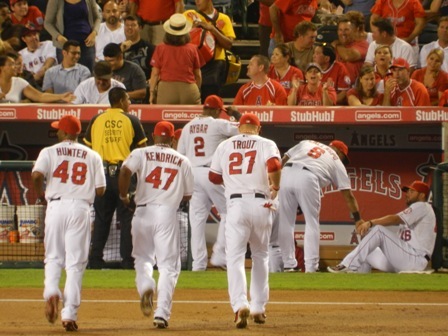 The Angels have to stop filling the bases up with no outs only to strand every runner at the end of the inning. The starters and bullpen need to need to be spot on. No more base running gaffes. No more fielding gaffes. 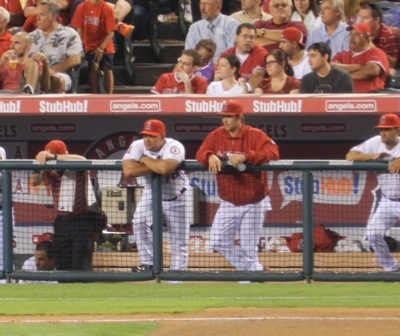 Practically speaking, the Angels need to play playoff baseball now and for the rest of the season however long that may be. Possible? Oh hell yes. Probable? We shall see. Fun? Absolutely! More ball park therapy, please. Stat! Allowed the opposing team to score 44 runs. Allowed the opposing team to hit 10 home runs. Were struck out 48 times. 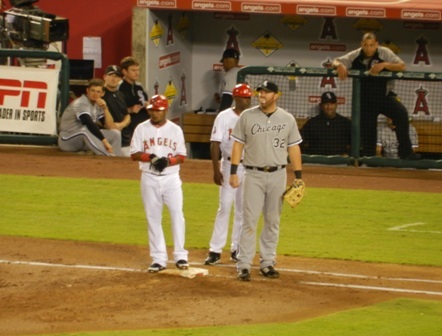 Came from behind to tie or pull into the lead so many times, they reminded me of the 2009 Angels who were among the league leaders in that regard. Blew the lead so frequently that none of those comebacks amounted to anything. Beat the division leading Rangers 2 times, one of which was more of a good old-fashioned shellacking. Lost to the division leading Rangers 2 times and the White Sox once, just for good measure. Left 40 guys on base. Went to the bullpen 16 times – 4 times apiece in the last three games. Moved out of 3rd place (yay!) to tie the A’s for 2nd. Shot past the A’s to a 2nd place that was just 3 games out of 1st place. Sank right back into 3rd place one game further out of 1st than they started. Brought me to my feet cheering repeatedly. Sat me right back down again in exasperation complete with loud expletives and an annoyed fist bump on the table for good measure repeatedly. Wow! There is an inordinate amount of both !!! and #$@! in that list. Come to think of it, I suppose this is true in different ways both for Angels fans and for fans of the opposition. So what on Earth are we supposed to make of a crazy, simultaneously hot and cold, brilliant upside, scary downside team like this? I would say that the Angels really need to get key players back off the DL in top form, or top August form at any rate, and figure out what’s broken with the starting rotation and fix it. This list just illustrates what those who have been watching the games already know – so many important pieces, essential to having a shot at the post season are already present, accounted for and how in the way the Angels are playing right now. However, the sick and amazing bullpen of a few weeks ago has become a sick and ailing bullpen in the absence of Scott Downs. As much as Andrew Romine looks like he can fill a big league short stop’s shoes in a few seasons, the defense and the base paths are both missing Erick Aybar. Recent, blessedly brief, stints with various strains for Mike Trout and Mark Trumbo did the lineup no favors. 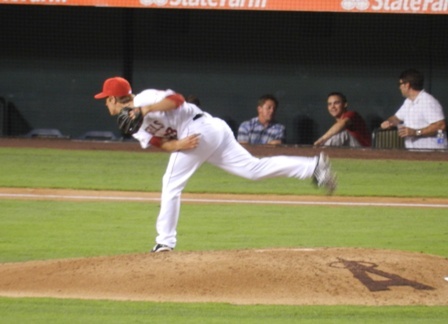 And the starting rotation is kind of, sort of, maybe just starting to come together…maybe. 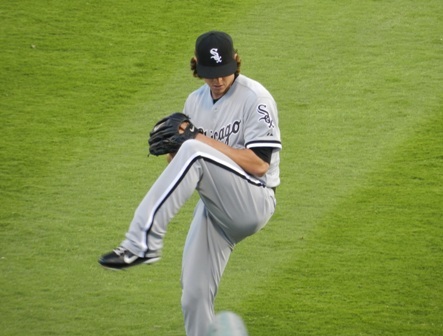 But Dan Haren did push back another start due to back issues. (On the one hand, way to go Danny for admitting you’re hurting and taking the steps you need to fix it. On the other hand, ouch. We need him back strong and we need him back now.) Ervin Santana is restricted to three innings until he can get his head straight. And Zack Greinke, if the small sample size of the last two starts are any indication, is still working through his home vs. road issues, though I do admire a pitcher who toughs out a bad few innings and finishes strong. The other thing I would take from this Jekyll and Hyde list is that the Angels season future is unclear. 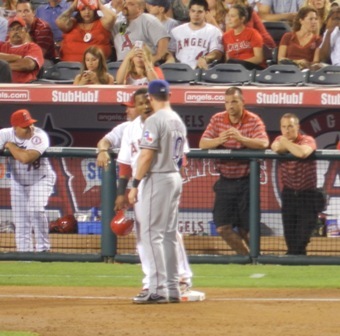 I know that a lot of folks saying it’s over now, that this Rangers series was the “the moment” and the Angels blew it. But I don’t buy that. Oh, I believe in momentum, but I also think that trying to pick out what “the moment” is in any season as it’s happening is impossible. It’s a little too much like writing history as it happens. Oh, plenty of people do write history as it happens and I can tell you as a history major that historians do value such analysis…but as primary source documents not as their intended purpose. The 2012 season is moving quickly. But we do have two solid months of baseball left and, for the Angels, much of that baseball will be played in the AL West. If they can get some guys back or start playing around their absence with more grace, well, anything is still possible. The Crack of the Bat! The Slap of the Glove! The Long Uncomfortable Silence of the Error? 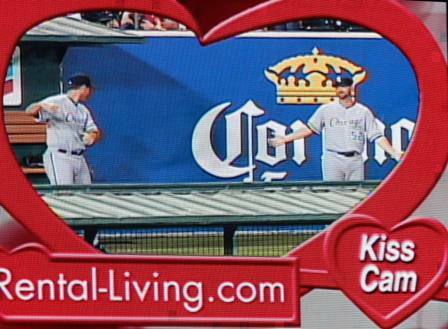 Okay, so it’s only Spring Training. The sights and sounds of the game are never going to be the same in Spring Training as they are when the real deal begins. Still, after so many long days without, they sound pretty darned musical to me. 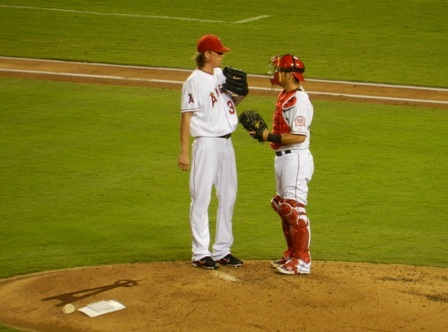 So, after two entire Angels games, one of which only aired on the radio and one we watched this evening via that faithful friend of the working stiff, the DVR, I have a few thoughts. 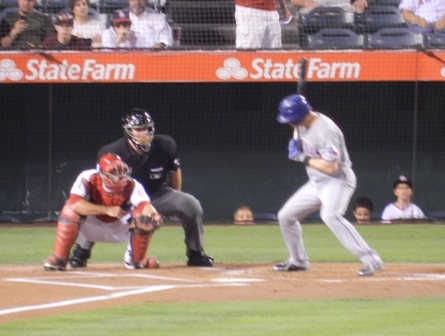 Albert Pujols and that gorgeous swing looking good from the first at bat. C.J. Wilson looking like he’s in season shape already or pretty darn close to it. The regular infielders doing their regular season thing in the field and at the plate. One possible incarnation of the outfield doing their regular season thing in the field and at the plate. Alberto Callaspo belting the ball and playing his position with an “Ahem. I’m still here!” swagger and chip on his shoulder. 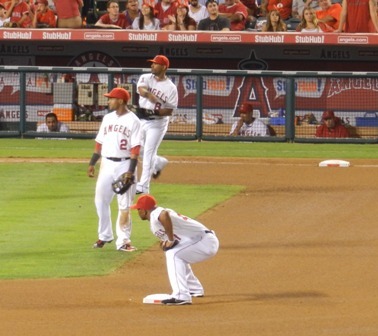 Angels infielders turning two in March with a decidedly May kind of ease and precision. Have you ever noticed that the sound of the ball slapping the glove during a solid 6-4-3 or 4-6-3 is just a little different than it sounds during any other play? Three fast, solid thunks in precisely measured succession. It’s a lovely sound! Power from the catcher’s position!! Yeah, yeah, yeah. Spring Training ball parks. Blah, blah, blah. I don’t care. 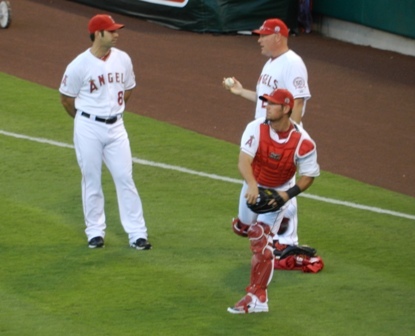 I have now seen current Angels catchers look like they actually know what they are doing in the batter’s box in two back to back games. And after last season? Yeah, that’s a big deal. Angels ball players looking relaxed, rejuvenated, and very at ease with one another…until they start talking about the coming season and then there is a fire in their eyes. Love that! Oh my word, the errors. With every team, in every game. Balls zinging out of gloves. Sailing lazily past gloves. 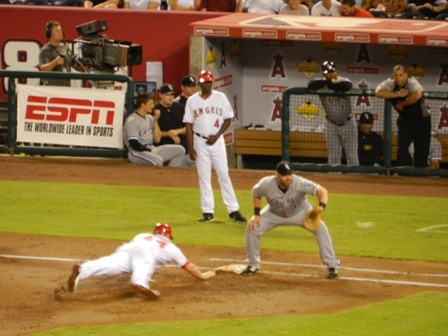 Dropping softly at the outfielders’ feet… Throws going into the outfield. The backstop. 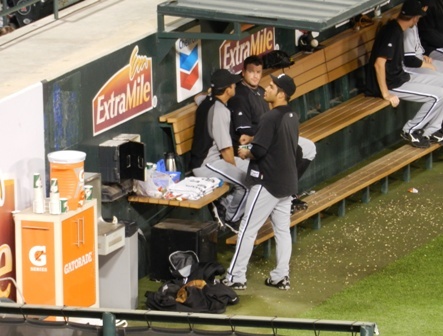 The dugout. The stands… And some of the pitching and hitting? Ugh. Yes, this is why we have Spring Training but it is also why Spring Training will never be as good as the regular season. 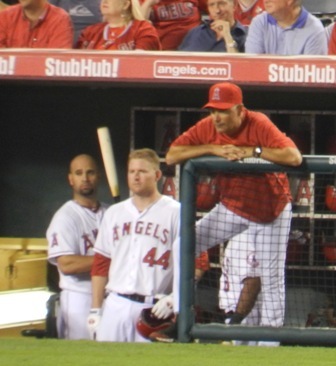 I’m not particularly impressed with most of the Angels kids so far. Not last season’s rookies or Mike Trout who spent a fair bit of time in the Bigs last year. I think my appreciation of their efforts and the breath of fresh air they bring has been thoroughly documented on these virtual pages. No, I mean the younger prospects. I really like Alexi Amarista whose gutsy, athletic, maximum effort style of play in a diminutive package reminds a bit of Dustin Pedroia. 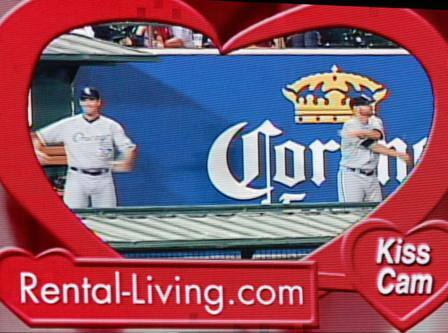 And I like Andrew Romine who has demonstrated great instincts and a gift for pulling plays out of thin air in the past. Other than that, I don’t see anything that impressive yet…of course, I wasn’t that impressed with Tyler Chatwood last Spring Training, so I can’t claim to have the best eye for the subtle nuances of a rookie-to-be’s performance. The usual: No one stays in the game for very long, even when they’re doing well. Small stadiums make for quiet games. Even the announcers…heck, even the sound and picture quality seem to be in training right along with the players. We got to watch baseball. Real, current – if not precisely live – baseball over dinner for four days running now. And this evening my husband looked from the game to me with a very contented smile, all of the strain of the day gone from his face, and sighed. This is a nice evening, he said. It’s great to have the back game on. I couldn’t agree more…and that part needs no Spring Training specific header. That part is universal. Keep Him In Coach. We Need Him to Play. 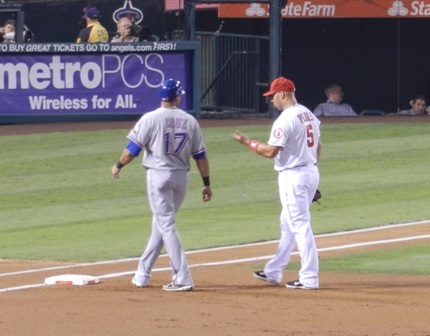 The Angels have played ten games since Mike Trout was recalled from the minors and in that time they are 5 and 0 in games where Trout has started and 2 and 3 in games where Trout did not play or entered the game as a pinch hitter in the 8th inning. And one of those losses? That would be Friday night against Texas. 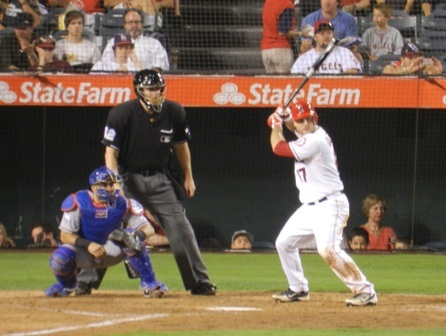 Upon entering the game in the 8th inning, Trout continued a rally begun by Howie Kendrick. His hit moved Howie into position to score on Mark Trumbo’s line drive single and set the stage for Russell Branyan’s three run homer. 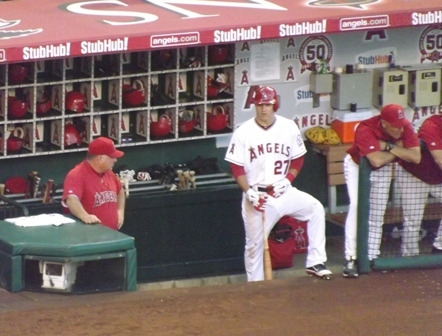 Imagine what could have been if Trout had started the game? 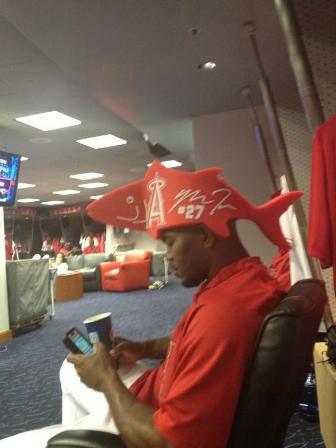 No, I’m not saying Mike Trout is the chosen one, a one man offense here to single handedly save the Angels. But I do think he is proving himself to be the missing spark this team needs. It’s not that the Angels don’t have any bats, it’s that we don’t have enough bats and that there are far too many dead spots, all but guaranteed outs, dotted through the lineup in between them. How many times have we watched a mini rally start only to die without a single man scoring? Or bases loaded with one out turning into one measly run followed by someone grounding into a double play? 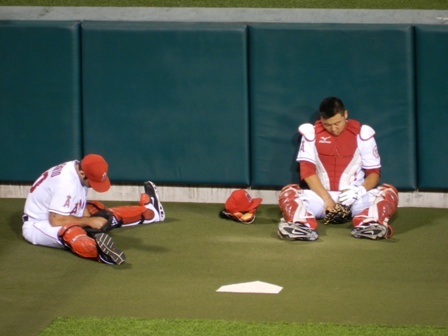 This happens to every team, but it happens to the Angels so often that we’ve grown to expect it every inning this season. 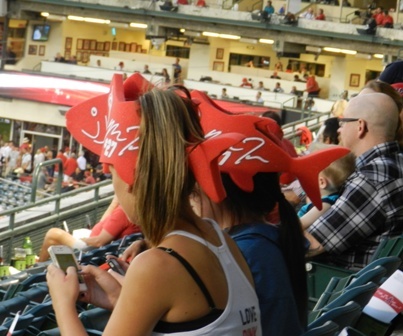 How excited do we Angels fans get when the team scores just four runs? ‘Nuff said. But what if we had just one more clutch bat in between our existing bats, someone to keep the offensive outburst going once Macier or Bourjos or Howie starts it? Someone to knock Torii Hunter in when he gets on base? 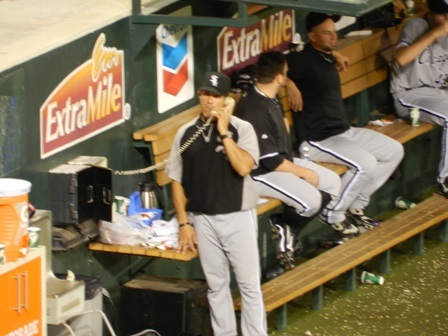 Heck, just one more guy not grounding into an inning ending double play? Well, we’d have our sweep of the Orioles, or last night, or our win against Texas on Saturday, or what Friday night against Texas very easily could have been if we’d had just one more clutch bat in the game a few innings earlier. 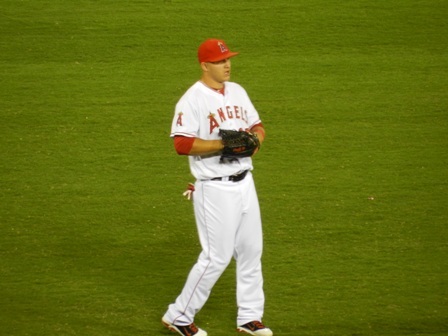 Yes, Mike Trout is young, not even a month past 20. But he doesn’t seem overwhelmed in the slightest. In addition to his bat makes good decisions in the outfield, has a fantastic glove, runs great routes for the ball and, with his speed, is a perfect complement to Peter Bourjos in the outfield and a terror on the base paths. And the frightening part is, he’s still growing into his skill set and showing a lot of improvement, even just since his last trip up to the majors. His arm looks a little stronger and then there’s that bat! 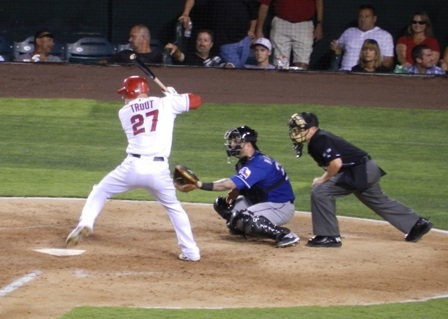 Trout returned to the majors with a .163 batting average – hey, he only played in a handful of games on either side of the All-Star Break and, like a lot of rookies, it took him a few at bats first to connect and then to stop hitting it right at people. After five additional full games in the majors and two single at-bat pinch hit appearances, Trout has dramatically increased his batting average to .246. 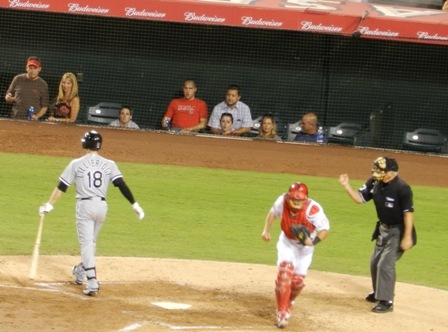 Between that and two homeruns and five RBIs last night, making Trout the youngest Angel to have a two-homerun game, I think it’s safe to say he is no longer overly impressed by Major League pitching. What do you think? 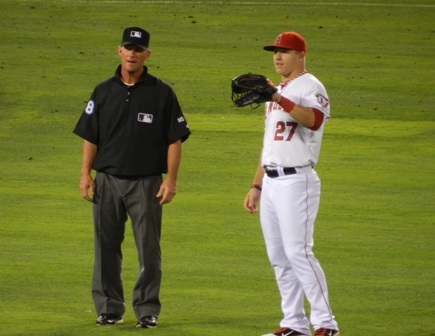 So, this post was originally going to be a plea to Mike Scioscia to put Mike Trout back in the lineup tonight. Because, of course, he reads this blog and takes my opinions into careful consideration before making lineup decisions, why do you ask? 😉 But, much to my delight, they just posted the lineup and Trout is already there!!! And suddenly I am even more excited for this game. Go Angels!! So, I was wondering instead…Sosh, pretty please, with zesty homemade marinara sauce and good imported parmesan on top, can we keep him in the lineup now??? He’ll be the offense’s new best fri-end. Thanks, ever so!